1SYSTEM K4 – the newest dry cleaning system, the only one in Burgas in the atelier of 50 Hristo Botev str. SOLVON K4 has many different properties from traditional solvents in dry cleaning. It is a non-halogenated organic solvent with a purity> 99% and excellent cleaning performance. The innovative solvent is not only capable of dissolving and absorbing lipophilic (fats and oils), but also hydrophilic soil (water-soluble soil). There is also a slight wear on the fibers during the cleaning process, as well as fewer folds. According to the current state of legislation in Europe, SOLVON K4 is neither a dangerous material nor a dangerous substance! SOLVON K4 is biodegradable and dermatologically tested with „very good“. Such a combination of properties so far has not been achieved in the history of dry cleaning. The results of preliminary market tests show that SOLVON K4 has the potential to become a paradigm for dry cleaning. SYSTEM K4 with solvent SOLVON K4 provides all requirements for effective and hygienic cleaning of delicate textile products. For highly grimy zones, SYSTEM K4 offers a cleaning agent – PRENETT K4. It reliably removes affected areas of clothing (collar or cuff). PRENETT K4 rinses free residues and helps remove dirt during the cleaning process. PRENETT K4 is free of volatile organic substances and has no additives. Even in small quantities, PRENETT K4 is highly efficient and at the same time protects delicate textiles. To remove certain stains, Kreussler recommends the use Deprit Professional Series and Prenett A, B, C products. CLIP K4 is a highly concentrated dry cleaner that boasts excellent cleaning power and hygienic freshness. It protects against darkening, has excellent anti-static properties and permanently improves the comfort of dry cleansed clothing. The white remains white after dry cleaning, the colors are fresh and the feeling is superb. Not only dirt but also exterior smells, for example after a fire, are totally removed when using CLIP K4. When cleansing the leather, it is no longer necessary to add lubricants or softeners. The leather is clean, wonderfully soft and just feels good. With a little quantities of highly concentrated CLIP K4, very good cleaning results can be achieved. For water repellency and stains with VINOY K4, the fluorocarbon resin has already been pre-dissolved in SOLVON K4. System compliance keeps the solvents clean and prevents unnecessary residues. Ensure that the chemical-physical properties of the solvent remain unchanged. This leads to increased safety of processes and work. The clothes get a complete feeling and excellent protection and water-repellence. This successful quartet is perfectly complemented by cleaning machine of Kreussler‘s partners FMB (UNION, FIRBIMATIC, REALSTAR, etc.) that are tailored to SOLVON K4. High performance at low energy consumption, due to higher technological levels of distillation and drying processes, short cycle time. Lower costs for disposal of distillation residues due to the solvent SOLVON K4. Dry cleaning dates back to ancient times. It begins with the discovery of textile clothing. In the ruins of Pompey are found trove of a well-developed craft of fullers who were so-called professional clothes-cleaners. Then was used a strong alkaline solution and ammonia for washing clothes. A special kind of clay, called “the clay of the fullers”, was used to absorb fats and stains of clothes that were too delicate to be washed. There are many stories about the origins of dry cleaning. Like many other discoveries, this happens accidentally. In 1885, in Paris, Jean Baptiste Julie, the owner of a dyeing fabric manufactory, accidentally knocked down a gas lamp and gas, spilled on the tablecloth. He was not angry because the cloth was already dirty. The gas quickly evaporated, and Jean Baptiste noticed that the tablecloth had become cleaner and the stains had disappeared miraculously. Jean Baptiste decided to offer a new service and called it „dry cleaning„. Thus began work first registered company for dry cleaning. Although chemical cleaning is called „dry cleaning„, it is not completely dry. The cleaning process used liquids that were initially different – for example, turpentine, kerosene and gasoline. These liquids are highly flammable. Dry cleaning was a very risky craft until less safe solvents were developed. In practice, serious technological developments have taken place over the last 75 years. After the end of the World War II, highly volatile carbon tetrachloride and thrichlorethylene gave way to a new product – perchlorethylene, which is a non-combustible synthetic solvent. It becomes dominant not only because it is much safer but also because it cleans up much better. It does not require such sophisticated equipment and can be installed in virtually any shop. This is becoming an ideal quality service for an hour. Of course, there are other dry chemical solvents. Developments of newer technologies continue. Dry cleaning machines, despite the differences, have the same principle of action. The cleaning solvent is in the tank. The pump moves the solvent through the machine during the cleaning process. The filters retain the solid dirty particles. And the drum is where the clothes are placed to be cleaned. There are special ribs that help to properly move the inside of the drum. The principle of the dry-cleaning machine is very easy to understand. The pump pulls the solvent out of the tank and sends it through the filter to clear it. The filtered solvent enters the drum, removes the dirt from the clothes and refreshes them. Then he runs out of the drum, passes through the basket for hold buttons and returns to the tank again. This process is repeated during the program and thus maintains the solvent clean enough to achieve a good cleaning of the clothes. After the cleaning cycle, the solvent is drained from the drum and begins „solvent extraction“ cycle i.e. drying. During the drying process, the rotation speed of the drum is increased in order to use centrifugal forces to dry the clothes. Drying uses warm air that rotates inside the drum to evaporate any residual solvent on the clothing. The solvent is purged in a distiller which is heated and the vapor is again condensed in liquid. The purified solvent is returned to the tank. Viewing and Numbering – Each order is numbered and described, notice the date for which the order must be ready. Each piece of clothing has fastens number that stays there during the entire cleaning process. If a garment needs special attention, for example to remove a stain, it is marked with a special color label on the spot itself. Before cleaning, the clothes are checked and sorted according to the type of processing. Pre-treatment – with special pre-detacher detergent (from the French detachér – removing stain) the different types of stains are treated, the use of the detergent depends on the origin of the stain itself or the contamination. Heavily contaminated clothing is pretreated with a detergent that enhances the solvent’s cleaning performance in the machine. Dry Cleaning – While the clothes rotate in the drum, there is a constant flow of solvent from the pump and the filter system. Solvent wet the clothes and pulls out the dirt, then goes through the filter, purifies and returns to the drum again. The next cycle pumps the solvent out of the drum and centrifuges the clothes to squeeze them out of the solvent. Dry air dries clothes and extracts all residual vapors from the solvent. Subsequent processing – After cleaning in the chemical machine, the clothes are revised for any remaining stains. Using professional equipment and chemicals, the clothes are treated with steam, air and vacuum. In painstaking work, most stains can be removed. Some of them, however, can not be completely cleared for a various reasons – for example, old tannin spots fixed by heat; Faded color of the garment; Blemishes or bleaching from sunlight; Paint stains and more. Finishing – the final phase includes shaping, ironing and packaging. Once the clothes are cleaned, ironing is coming. A professional ironing table with a steam iro6n and a mannequin with steam for coats and jackets is used. Finally, the clothes go through a quality check again and the orders are packaged and sorted according to the numbering. All you do is leave your clothes in the dry cleaning and then go to pick them up. In the atelier will take care of all, why waste valuable time for washing and ironing when you can get very high quality and convenience. 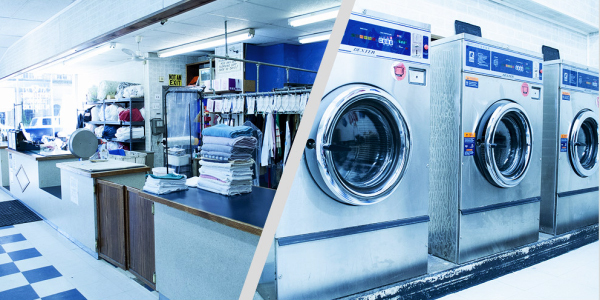 The dry cleaning as a process itself uses fluids to remove grease and stains from matter. Among its many other advantages is its ability to dissolve fat and oil in a way that water can not do. Natural fabrics such as wool and silk are cleansed perfectly by dry cleaning. They could shrink, reveal or discolor when washing with water. Synthetic fabrics such as polyester also respond much better to dry cleaning, while after washing with water oily stains remain. The dry cleaning regains the colors of the clothes, preventing shrinkage, loss of color, change of matter. This is particularly noticeable in the expensive and nice fabrics where is gets the so-called „shine effect“ of matter. Specialists in dry cleaning ateliers have the necessary knowledge, experience and equipment to clean your clothes properly. Why you need to do at home when you can get a good service from a specialist. Finishing – Thanks to the special ironing equipment, the professional finishing gives the garment a smooth and finished look, as if it were new. Besides, you do not have to spend the weekend in front of the iron table with a hot iron in your hand, and you would save yourself by occasions with your clothes inadvertently. Home textiles – in the dry cleaning atelier can cater not only for your clothes. Here you can also clean blankets, pillows and duvets, quilts, rugs, carpets, upholstery, as well as curtains, tablecloths and so on. Control – Before returning your items, the specialists check once again that quality service has been achieved. If a slip is noticed, the garment returns for reprocessing (no charge), so we guarantee that the garment is cleaned in the best possible way when you get it back. Perfect outward – exactly so your clothes will look like when you take them out of dry cleaning. You’ll have perfect edges on your trousers. You will have a perfectly ironed shirt. You will have a clean and combed coat, and so on. Knowledge of fabrics and fashion trends – perhaps you do not know what is viscose, silk, cotton, and you are hardly aware of the Angora, chinchilla or thousands of Indian fabrics. There are plenty of fabrics and fibers that specialists need to know to be able to care for the clothes they get. Each cloth can react differently depending on the treatment applied. Here, the best way to process your garment will be chosen according to the fabric and the processing marks placed by the manufacturer. Laundry – in the dry cleaning atelier there is a professional laundry and a professional ironing equipment – a callander. You can have perfectly washed shirts, trousers and blouses without losing time at home. Your daily clothing will look fresh and beautiful. Ties – often ties are one of the delicate fabrics, because they are mostly made of silk and require special care. Have you seen a washed-out tie in a washing machine? It seems to be crushed, the glue and the starch on it are no longer the same, the tie looks like a rag. Only in dry cleaning ties keep their shape and ensure their use for a long time. Removing stains – we have over 42 kinds of special stain removers. The different types of stains on the garment require a different detergent to be processed. Extending the life of your clothes – contrary to the claims, frequent dry cleaning of clothes does not damage clothes in any way. On the contrary, it prolongs their life, removes stains more easily and prevents tissue wear, which is a consequence of accumulation of dirt and grease. Color refresh – Regular dry cleaning removes stains that can oxidize over time, cling to the fabric and cause yellowing of the garment around the stains. Once yellowed, such stains are very difficult to remove or can not be removed at all, depending on the length of time they were left unprocessed. For example, such yellowish spots are mostly in the collar, on the sleeves. Contaminated clothes left for 7 to 8 months in the wardrobe after a chemical cleaning look much brighter. Go in – go out – it takes only a few minutes to leave and take your dry cleaning clothes, thanks to the specialized software. Chemical cleaning is not an unique answer for all types of fat and stains and their removal. Sometimes the stains are permanently sealed in the fabric and it can not withstand normal detacher processing. Also decorative ornaments, for example, sequins and stones, are incompatible with the chemical solvent. For the correct choice of how each garment to be processed, it is important for users to acquaint with the general rules for acceptance of cleansing clothes, and to observe all the factory instructions for the maintenance of the garment and to observe them strictly.